Lord Bowler:"Sorry Brisco, but I am a special government agent. Means I can do anything I damn well please." 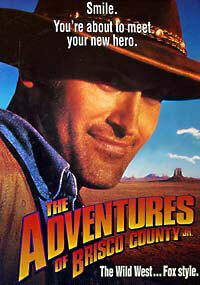 Brisco County:"We heard you were alive Pete." Lord Bowler:"We just didn't believe it. We saw you get killed by that Chinese death star with our own eyes." Pete Hutter:"Well that's the thing about your Chinese death stars. An hour later, you're alive again." Federal Agent:"Are you familiar with one Dixie Counsins, AKA Myra Simon?" Federal Agent:"One of my informants recently spotted her in Pasadena. I want you to go down there, pick her up, and bring her to me by noon monday." Lord Bowler:"Why? She in trouble?" Federal Agent:"I'm sorry, but that's on a need to know basis Mr. Echohawk. However, I'm prepared to make you a credentialed agent of the U.S. Government." Lord Bowler:"Is that all I get out of this?! A fancy tin horn and a fine howdy do from Uncle Sam?" Federal Agent:"How does 5,000 cash sound Mr. Bowler?" Socrates Poole:"Short of murder, you've been charged with or convicted of pretty much every crime in the book. Isn't that correct?" Pete Hutter:"I have never violated any agricultural quarantine laws." Sheriff Aaron Viva:"Any chance we can get something to gnaw on?" Lenore Raymond:"Of course Sheriff, what will you have?" Sheriff Aaron Viva:"4 chicken fried steaks, 2 top sirloins, 6 baked potatoes, a loaf of bread, a stick of butter, a pound of tapioca and a gallon of butter milk. Mr County, you want anything?" Sheriff Aaron Viva:"Oh and make those steaks well done darling, I ain't ordering no pet." Pete Hutter:"Forget about it? You mean rip it from my memory like a picture from a book? A picture of a small boy, kind of shy, with big ears who only wanted to be liked. And the laughing faces of his classmates, mocking him because he forgot to wear his pants to school! Is that what you mean?!" Dixie Cousins:"That man is definitely horizontal, which ain't all bad." Sheriff Aaron Viva:"You boys ain't nothing but hound dogs, crying all the time." Dixie Cousins:"What do we do now?" Brisco County:"Well, I can swing out, get a good foothold and climb up to the top of the stage. And then if I'm real careful and God is on my side, I could leap onto the back of the rear horse and work my way out to the lead team, taking care not to fall beneath their thundering hooves. Then reach out, grab the bridle of the lead horse and rein them in to a safe and steady stop." Brisco County:"Or we could jump!" Pete Hutter:"I believe I've been perforated!" Pete Hutter:"So long! Farewell! Auf Wiedersehen! Good night!" Sheriff Aaron Viva:"Don't make me use my stuff on you baby!" Sheriff Aaron Viva:"Thank you. Thank you very much." Pete Hutter:"The only thing tinier than your brain is the likelihood that a mouth breathing, psychopathic wall of stink weed like you is ever gonna get out of this dung hood. You got 'leper' stabbed on your forehead, just like everybody in that micro-cephalic, imbecile-raided, beer-sucking, cousin-marrying family of elephantenisis that you come from!" Lord Bowler:"Is that all I get out of this?! A fancy tin horn and a fine howdy do from Uncle Sam?!" Brisco County:"Well Professor, where you headed?" Professor Albert Wickwire:"Well I got an appointment with a group of German investors. Some Count named Von Zeppelin." Brisco County:"Well don't give away too much." Professor Albert Wickwire:"Oh no no. All he wants is to have it named after him and some metal armaments for combat." Brisco County:"Ha, very fancy. A lead zeppelin! Might just be your stairway to heaven." Professor Albert Wickwire:"Yes indeed! If I sell him just one airship, it will be a good year!"